We chatted to bass player Alex Webster, one of the two founding members still remaining in the band about the bands upcoming return to Australia and his thoughts on Australia’s underground extreme metal scene over the years. Hey Alex, thanks for taking the time to chat today! 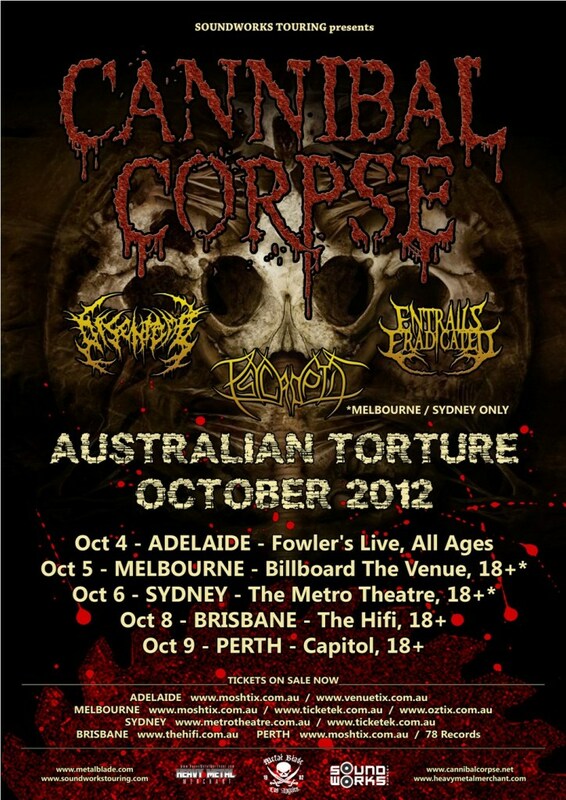 So Cannibal Corpse is set to return to Australia next month, this is becoming a pretty regular thing now isn’t it? You know the first time we came was way back in 1995 and then we didn’t come back again for a long time. I’m not sure why, maybe there wasn’t any promoters bringing bands like us down for a while, but once Soundworks got going they’ve brought us down first in 2007 and then again in 2009 and then here we are again, coming back three years later. It’s something we’d like to do for every album and I guess we do an album once every three years, so it should work out that way for the near future anyhow. This time around for your third visit, you have a 5 date tour, which is a pretty enviable position to be in given Brisbane, Adelaide and Perth aren’t often on every bands touring schedule. How have you noticed the growth in the band down here with each visit? It’s been really, really good every time we’ve come down there and especially these last few times the shows have been very well attended. We’ve been able to do shows in all those 5 cities on the list before and they’ve been great shows, every one of them, not just Sydney or Melbourne. Hopefully we can keep doing those five in future tours and maybe even look at adding a couple more shows next time around. I’m not sure how often international bands do that, but we’ve had a lot of success and we want to keep coming down there for sure. You have Disentomb, Entrails Eradicated and Psycroptic supporting you this time around, how familiar with these bands, Psycroptic you toured with last time didn’t you? Yes, I’m very very aware of Psycroptic, we think they’re an amazing band and we’ve toured with them before. I actually wasn’t aware they were playing any of these shows, but if they are, then that’s a great surprise. We knew that Entrails Eradicated were playing, they’re very fast and brutal and technical and the one guy in the band who we also know, he’s a friend of ours, so they will be fun. 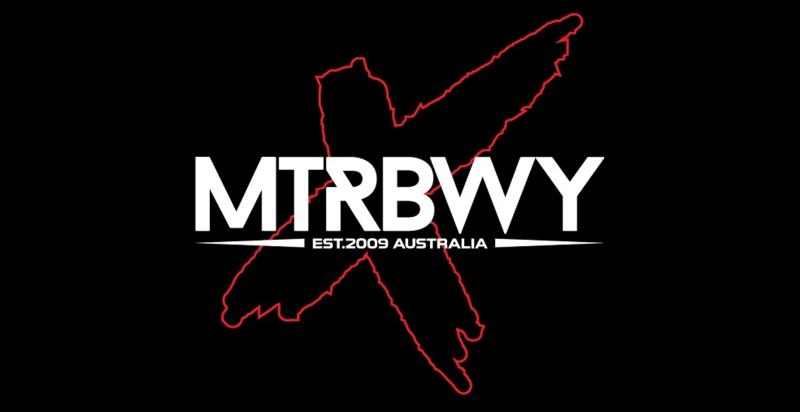 Speaking of your observations being obviously one of the leading extreme metal bands in the world for around 25 years, what thoughts do you have about the reputation, or I guess awareness of Australia’s extreme music scene over the years? Everybody who has really followed the underground scene for a while, guys our age, who did tape trading and stuff years ago, we’ve been aware there’s been a strong underground scene down there for as long as there’s been one anywhere in the world. 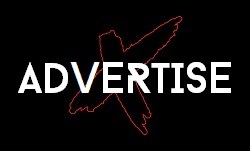 Bands like Sadistik Exekution, Destroyer 666, Bestial Warlust, Slaughter Lord, there’s been some bands that have been playing some super extreme kinds of metal for a long time. Then you’ve got thrash bands such as Mortal Sin. There’s a long history of bands you’ve got down there and it’s great over the last 6 or 7 years it’s also recently opened up for touring as before then opportunities were few and far between for bands like Cannibal Corpse. It’s great that us overseas bands get the chance to go down there and play to a bunch of fans that really do know a whole lot about metal. It’s a killer scene but the distance has always been a factor for us. After you demolish Australia you have a visit through Asia, where you will be playing places you’ve never played before, am I correct? You know I’m the guy in the band who keeps track of all this stuff and we’ve played at least 52 countries now, maybe 53, but out of all those countries we’ve never played Thailand, Indonesia, China and Taiwan. So there’s those 4 new destinations on this tour we will be hitting this time and it’s something we’re excited about that’s for sure. 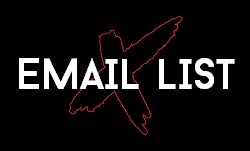 Given you are the man with the list, anywhere you haven’t yet played then that’s high on the list of places to conquer? You know there’s a few places quite a few left, I’d really like to play India that’s probably top of that list. There also the Philippines and Malaysia, which I’m surprised we’re not visiting given we are so close on this tour. Singapore also has a great scene, then there’s also Dubai and I know the United Arab Emirates has opened up to doing metal shows so we would love to get there as well. You guys have just recently come off the Summer Slaughter tour over there in the USA, how did that go, is the scene alive and well over there? That tour went really well and was a tour that had a lot of variety from top to bottom. It was a big tour, with 9 bands, then maybe 1 or 2 local bands as well, so it was a pretty long day for the fans. But I think the days went through really quickly as there was a good crew running the stage and making sure everything was running smoothly and also the bands each sounded very different. If you look at Goatwhore versus Periphery they’re very different from each other as are Exhumed and Veil Of Maya and if you compare us to Between The Buried and Me we are also very different from each other. Having that variety made a long day, an interesting day. If it had of been all the exact same genre, it may have been too much on that show. Having that variety it brought in a lot of people who may not have otherwise gone to see those bands. It was a really cool tour and it worked out a lot better than I thought it might have. I saw the potential conflict between fans of the different bands, but it really didn’t pan out that way at all. You released ‘Torture’ earlier this year and no doubt you have included a bunch of tracks from the album into the setlist, how have they slotted in? Well our normal headlining set is anywhere between 80 minutes and 90 minutes depending of course on how long we take between songs and stuff. It’s normally a set of about 20 songs and what we try and do is have at least one song from each of our 12 studio albums in the set and then our new album, we try and give a good push. We had been doing 6 songs from Torture, which is half the album, but for Summer Slaughter we had only been doing 4 due to the shortened set. We are really happy with how Torture turned out and we really want to go out and play the songs live and push it because we are very proud of all eras of this band and want to ensure this is all represented in our live set, particularly our new stuff. By the time we are ready to do another album and tour again I’m sure we’ll have reduced the number of Torture songs to 1 or 2, so this is the tour to play a bunch of those songs. Hopefully everybody likes them, so far the reaction has been great and I haven’t heard too many people complaining we are playing too much new stuff, so I think we’ve maintained a good balance. 24 years and 12 albums the band has been in existence for, how much do you feel the way you tackle song writing has changed? It’s changed gradually over what’s been a long history of the band and it has been a gradual change. It was very, very collaborative in the beginning where we would basically be in the practice room and nobody had done any homework and we would just show up and start writing together. That did work out well, but some of those songs really did show that lack of direction. I guess we were really just winging it and a lot of them seem like one riff after the other because that’s basically what they were. But we felt that lately having one person writing an entire song works really well and having them prepared in advance, rather than working on a song in the practice room, that’s been working better. But that’s not to say we aren’t open to still doing a collaborative type of song where a couple of us might write it on the fly at practice. The song Scalding Hail off Evisceration Plague, that was a song collaborated between Rob and I, so we’ve had some of that stuff in our recent history, but most of it now is written by individuals at home. 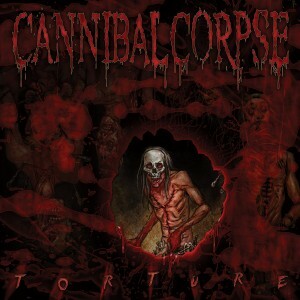 In the genre of death metal, Cannibal Corpse seems to have consistently remained at the forefront. What do you consider to be the key things that you guys as a band have done to maintain that vital relevance of the band in extreme music? For sure I think consistency and that’s consistency on a few different levels. We are not a band that has ever quit for a period of time and never had more than a couple of month’s layoff. We are always practising together and we’ve always maintained a constant cycle of albums and touring for us. There hasn’t been any broken points in that cycle or hiatuses for us. Most other bands have had that, although there are a handful of other bands such as Malevolent Creation that came out around the same time as us as well. But the vast majority have had a layoff of a few years. I think with us keeping going, we’ve never been that far out of people’s minds, people forget about you if you’re gone from the scene for 5 or 6 years you know. Then also is that we are consistent artistically, we’re a death metal band, every album we do is going to be a death metal album with horror oriented lyrics and people can always count on that. I guess also another factor I must say has been your relentless preparedness to tour the world consistently and take your music to the fans. Yes there’s that to, touring is something we enjoy doing and not every band does. I look at some other bands tours and they’re like maybe 15 to 20 shows long, ours are usually 25 to 30 shows and then we will back up a couple of them in a row. We just did a 33 show tour, had a week and a half off, then went out and did a 31 show tour. This year we’ve already done around 120 shows and we will still do another 30 or so before the years done, that makes around 150 shows for 2012, which is a lot. We’ve kept that going for every album we do and I think that’s the key, the bands that do a lot of touring are the ones who have a more personal connection with their fanbase and are the ones who stick around. That’s the key I think, if people get a chance to see you perform live, it sets you apart from all the bands they can only just listen to on an album. Ok, one last question to finish up on. Over the years, have you had someone come forward who is a fan of the band that has taken you by surprise? Well here’s one from a while ago, from back in the 90’s when I first moved to Florida. I met a guy working in a movie theatre, a regular clean cut guy and he was a big fan of Cannibal. That in itself is not that unusual, but I became friends with him and he ended up working for a Republican Congressman. He was a Republican and so a lot of people would find that surprising, a guy who was an assistant to a Republican Congressman, would also be a fan of Cannibal Corpse. But you know, he just loved that style of music and I bet he surprised a lot of people with that combination. Oct 5th Melbourne – Billboard The Venue, 18+ WITH PSYCROPTIC!!! Oct 6th Sydney – The Metro Theatre, 18+ WTH PSYCROPTIC!! !